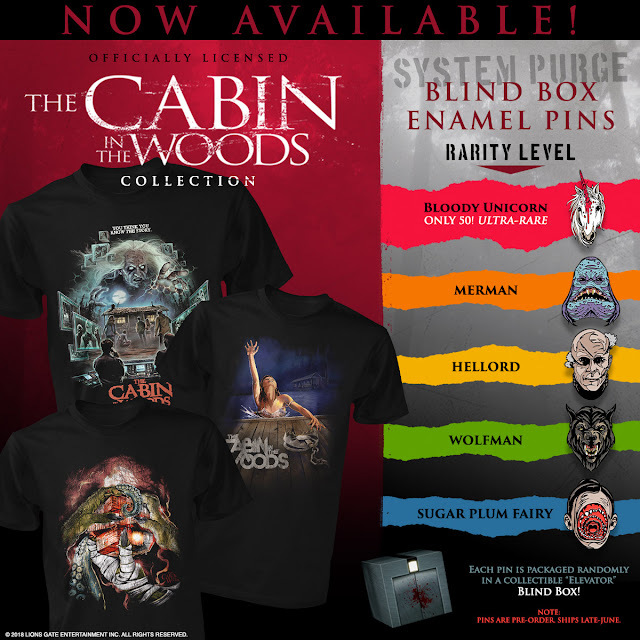 Check out Fright-Rags' The Cabin In the Woods & Mani-Yack merch. Five friends go to a cabin in the woods. Bad things happen. You think you know the story, but Drew Goddard and Joss Whedon turned the genre tropes on their head in The Cabin in the Woods. Fright-Rags has released new merchandise from the 2012 meta horror favorite, along with the new Mani-Yack collection. Fright-Rags' The Cabin in the Woods line kicks off with three T-shirts from artists Justin Osbourn, Abrar Ajmal, and Kyle Crawford. Ajmal's design parodies the iconic Evil Dead poster art, reflecting Cabin in the Wood's clever deconstruction of the genre. The company has also introduced System Purge blind-box enamel pins of five creatures from The Cabin in the Woods: Merman, Sugar Plum Fairy, Wolfman, Hell Lord, and the ultra-rare Unicorn. Each limited edition pin is randomly inserted in collectible "elevator" packaging. Fright-Rags has launched a line of Mani-Yack shirts featuring Jeff Carlson’s retro-style renderings of horror icons Leatherface (The Texas Chainsaw Massacre), Michael Myers (Halloween), Pinhead (Hellraiser), and Ghostface (Scream). Each deign comes in three shirt styles: black, white, and ringer. Head to Fright-Rags.com now to shop The Cabin in the Woods and Mani-Yack collections before they escape! Be sure to return to the site this Friday, June 15, for Fright-Rags’ latest “classick” re-print. Jeff Zornow’s Father's Day design, based on Creepshow, will be available on T-shirts, tank tops, and baseball tees for three days only.